February | 2015 | Be the One. The Ohio State University Agribusiness Club closed 2014 in an exciting fashion. On the Club’s annual trip, 23 members and the Club’s advisor, Barry Ward, traveled to Louisiana from December 17th to December 22nd. The club was lucky enough to receive many generous donations from Agribusinesses around the state of Ohio and a couple of Alumni who made the trip affordable to anyone who wished to experience agriculture down in the Bayou. On the first day of the trip, Students traveled the Conrad Rice Mill as well as Avery Island to the Tabasco Bottling Plant. But the students would tell you that the most enjoyable stop of the day was the Lafourche Sugar Refinery. While at the sugar refinery, students learned about what is involved with producing (domino) sugar. The manager of the Refinery, Greg Nolan, provided a full, in-depth, tour of the facility from the moment that the sugar cane gets weighed in, until the three grades of sugar are separated and all that is left is a bi-product known as bagasse. Nolan explained how the Mill controls the rate at which the Cane is harvested along with how the Mill is “waste free” and actually uses the bagasse to not only provide its own electricity, but also much of the surrounding area using steam power. The second day of the trip followed the educational patterns of the first day. 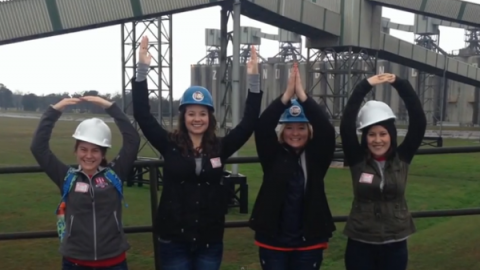 The students traveled to Darrow, Louisiana to Zen-Noh-Grain Corporation. The facilities at Zen-Noh-Grain had the ability to load two million bushels an hour which is unlike anything experienced in Ohio. After the tour, CGB and Zen-Noh treated the students to a true Cajun lunch at the Houmas House. Following the plantation house, the group traveled to Baton Rouge, to the Louisiana State University Aquatic Research Center and the LSU Botanical Gardens to see the facilities and learn more about research at LSU. The next day, the group traveled to Blue Harvest Farms, an eight acre blueberry farm with a future in Agri-tourism. The owner of the farm, Chris, explained to the students his dreams for the future along with many of the business and financial struggles that he has faced since starting his farm. The next stop, allowed the students to get up close and personal with alligators. At Insta Gator, the group learned about what these ranches have to do in order to obtain their alligators and of course, the students were all able to hold baby gators. The third day concluded with a local seafood cuisine followed by the Nutcracker, as a cultural experience. Student’s final day in Louisiana was spent exploring the famous city of New Orleans. The group saw much of the town including the French Quarter, the World War Two Museum, Café Du Monde, St. Louis Cathedral, and many local shops and restaurants. Altogether, the trip was extremely educational as well as entertaining. The students enjoyed experiencing the differences in agriculture in the south and networking with potential future employers. The “southern hospitality” was very evident and the Agribusiness Club is very thankful for all of the support and the opportunity to experience Louisiana.